Monteiro (in both Rio de Janeiro and São Paulo). New York\u2019s Nicholas Roerich Museum. Financial difficulties force Tarsila to change her lifestyle. falls from power and Brazil\u2019s \u201cSecond Republic\u201d begins. In March, Tarsila travels to Europe with Osório César. Their destination is the former U.S.S.R.
Osório travel throughout the Soviet Union. 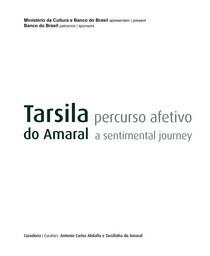 Tarsila and Osório return to Brazil in December. São Paulo\u2019s Constitutionalist Revolution breaks out. Artes (First São Paulo Hall of Fine Arts). guerra (Women in the struggle against war)\u201d. (First Exhibition of Modern Art), in São Paulo. Her relationship with Osório César comes to an end. affair, this time with journalist Luís Martins. 106 drawings that she had made in the years 1920\u20131933. (Palace of the Arcades) in São Paulo. time. She returns to pastoral themes in her paintings. titled \u201cCrítica e arte moderna\u201d (Criticism and modern art). e Antropofagia\u201d (Redwood Paintings and Anthropophagy\u201d). (Scholarly Journal) is dedicated to Tarsila. the article \u201cConfissão geral\u201d, penned by Tarsila. the Sacred Heart of Jesus) for the History Pavilion. for Livraria Martins Editora (Martins Bookshop Editors). Artista Plástico (Plastic Artist\u2019s House) in São Paulo. Albuquerque Lins (Albuquerque Lins Street) in São Paulo. Tarsila\u2019s lifework steadily gets more and more valued. Precursors of Modernism in Latin America. Dulce, Tarsila\u2019s only daughter, passes away. de Ouro (Gold Dolphin) prize the same year. Tarsila passes away in São Paulo on January 17.